Distance so far: 15 543 km. Weather 27 degrees C, sunny. 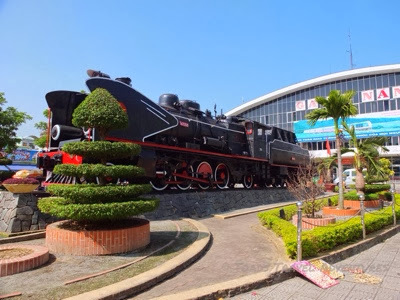 This is the second rail leg of my Vietnam journey – this time on a train called the “SE3” – which like the SE1 also travels from Hanoi to Saigon, but setting off later in the day – so a lunchtime departure from Da Nang on day two. This hasn’t been a particularly fun trip, so apologies that there not many photos here, but you will soon understand why I was otherwise engaged. Da Nang station waiting room is getting busier by the minute, as my train is delayed by an hour – also the time that the Northbound SE4 is due to arrive on the same platform – mild but managed pandemonium. I get a seat amongst a bunch of Vietnamese aunties close to the door of the platform and try to settle in, but something is wrong, I’m feeling a bit poorly. The waiting room is getting hotter, louder and I need to lie down. Both trains arrive. Because of the way they are reverse shunted in to the station and new locos are attached, it would be quite easy to get on the wrong one. A kind porter helps me out though. A quick scrum and I am on carriage 11, berth 1. That’s like seat 1A on Concorde – only for people like Richard Burton and me! 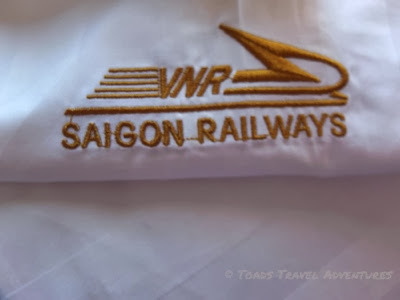 My immediate impression is that it is a good train – still generally grubby – but pressed clean white cotton bedding and air conditioning that is working well. The samovar is also operational and I check the water temperature to make sure that its boiling (always do this). 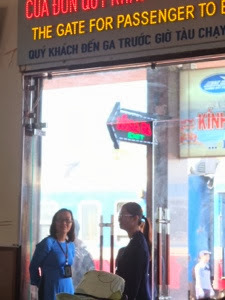 This train is painted blue, unlike the colour scheme of all the other state trains in Vietnam. Maybe its a Vietnameese version of the “Mallard”? 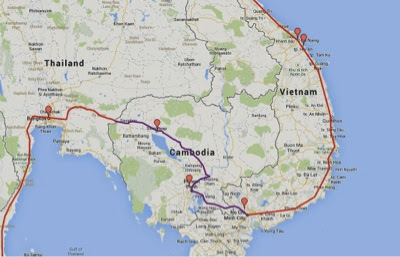 It certainly won’t break any speed records – 15 hours to Saigon – but it might be a more prestigious train than the SE1. I notice that the guard has his own small cabin and the food trolley is much more extensive here too. Unlike the SE1, there are no women living in cupboards.. I try to settle in with my Vietnamese compartment mates, but have to lie down. I do my best to have a conversation but my mind is set on lying still and doing nothing. I must be ill as I find it easy to screen out the shouting and screaming and close my eyes for an hour. 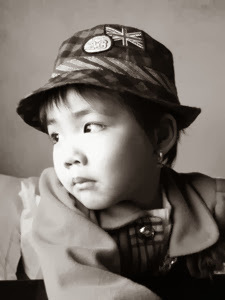 When I open my eyes, back in the real world, to begin with I’m sharing with a Vietnamese lady and grand daughter going to see their relatives in Qui Nong, and also a medical sales guy going South to a meeting in Tuy Hoa. They are all charming, and I’m beginning to actually enjoy sharing a compartment with the locals. I swat a few mosquitos around me in case they might be a carrying a deadly disease – or as Captain Willard would put it I – “terminated their command with extreme prejudice”..
Shivering now, so get out my down jacket and try to sleep. My fellow travellers eat instant noodles and fried chicken from the trolley service. The smell to me makes me feel dreadful, but there is nothing I can do about it. 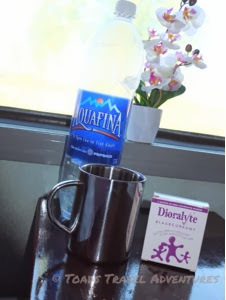 I mention in passing I’m not well to the medical sales chap in the berth above me, and he wishes me a speedy recovery after Tet. I can’t wait until Tet to feel better though..that is 22 days away (Vietnamese lunar New Year). Declare myself formally on “sick parade”, and break out the field first aid chest. I take all the pills that I dare, drink a double Dioralyte at an improvised dilution ratio and set up for bed. My stomach is cramping badly and I can only lie on my back. Feeling somewhat better, I turn in for the night. Sleep comes occasionally and with constant adjustment of the bedding. It’s mainly very cold, but warms up sometimes for no apparent reason, adding to my fever. The other thing that you have to contend with on the SE3 is the announcements half an hour before each stop. They are lengthy, highly professional and pre recorded in English as well as in Vietnamese – with game show music – maybe a Vietnamese “Who isn’t a (Dong) Millionaire?”, “Or The V Factor”? Anyway, I now know the population of every province we have passed through and their tourism selling points. Get up feeling slightly rested, make some reasonable coffee and sit alone in the darkness whilst everyone sleeps fitfully around me. Start to write this blog. After 10 minutes I feel sick and head for the toilet (which I should mention is quite like a Russian submarine on this train – lots of pipes and valves, and you would not want to press the wrong button). Spend another 20 minutes retching and heaving, even though I have not eaten for almost 24 hours. “Better out than in” as they say. The window is open in here and I’m soothed by the fresh cool morning air. What has made me this sick? I woke up feeling okay this morning and went down hill as the day went on. Maybe a 48 hour delayed reaction from oysters and clams possibly..? My symptoms suggest it could be, as I have tingling and breathing issues too. It’s not an unexpected problem to have to deal with, but nonetheless a challenging one on a train.. Anyway I’m about to check in somewhere that I can convalesce in for 48 hours before I begin my fairly intensive trip to get me to Bangkok on Sunday night. I could name just a handful of hotels in the world that I would be happy to be ill in, and one of them is The Caravelle in Saigon.